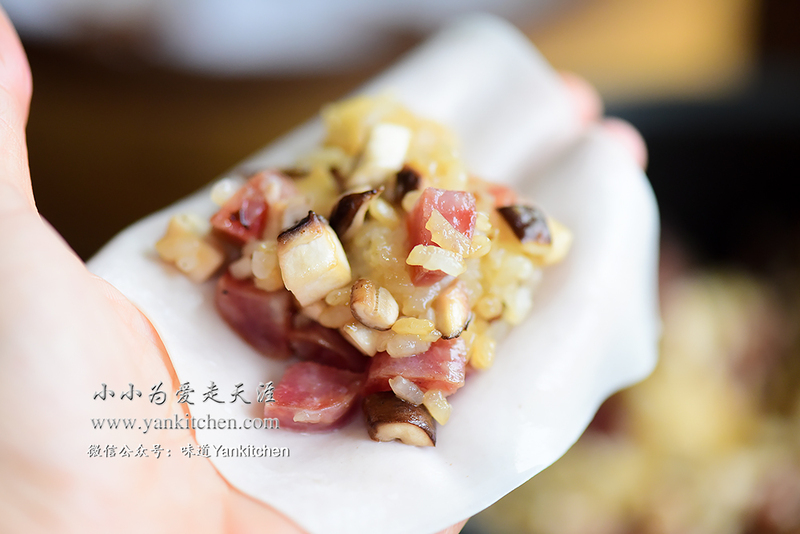 I posted Shiu Mai with ground pork, mushrooms and sweet rice before: https://www.yankitchen.com/english-blog/2018/11/13/shiu-mai-with-ground-porkmushrooms-and-sweet-rice. It is a very popular choice in Dim Sum restaurants. Cantonese’s style shiu mai is usually made with shrimps and pork. I personally prefer the ones made with sweet rice. Shiu mai wraps are usually super thin and come with ruffled edges to achieve flower-like shape. 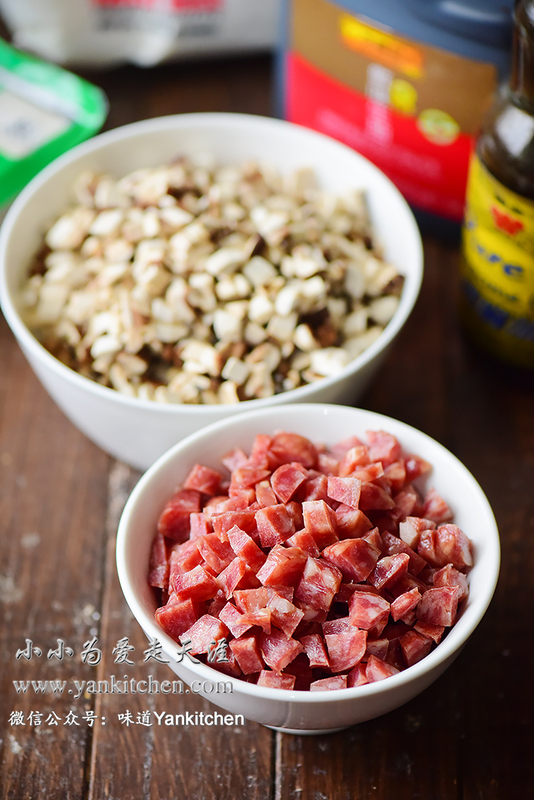 For the purpose of efficiency and easy operation, when making shiu mai at home, shiu mai wraps can be substituted with wonton wraps. 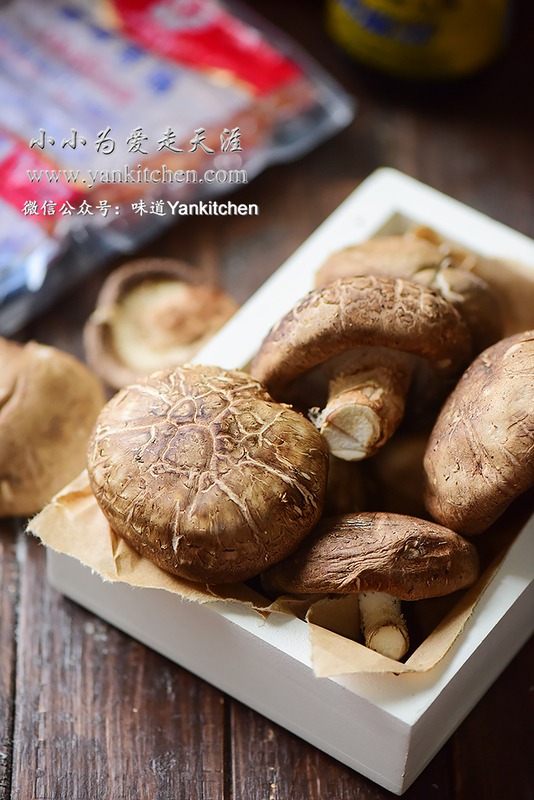 Wipe the shiitake mushrooms clean with damp kitchen paper towel. I use Taiwanese style sausage this time. They taste quite similar to Cantonese sausage. Wonton wrap is available in every Asian grocery market. Dice up sausages and mushrooms. Fold in soy sauce, dark soy sauce, oyster sauce and ground white pepper. Allow the rice mixture to chill for 10 minutes or so. Fold in diced sausages and mushrooms. Add salt to taste. Gently mix everything together. Add a couple tablespoons of sweet rice filling to center of the wonton wrap. Repeat the process until all are finished. The listed ingredients above yield about 50 to 60 shiu mais. Freeze extra ones if they are too much for a single meal. The dipping sauce is made with balsamic vinegar + soy sauce + chili oil sauce.